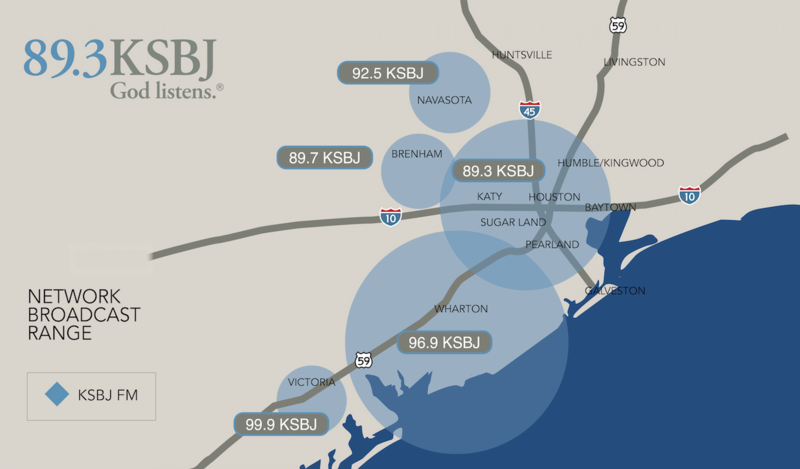 HOUSTON, Texas (March 21, 2019) – KSBJ Educational Foundation is proud to announce that for the first time, 89.3 KSBJ will now cover all of Houston, reaching 1.7 million more Houstonians! The improved signal goes LIVE on Friday, March 22 at 7:40am. In 2017, we all watched as Hurricane Harvey’s floodwaters rose. Through those helpless hours, the flood inundated the KSBJ transmitter buildings, knocking us off the air. All we could do was trust, pray, and wait … and wonder why God would allow this to happen to our city. Those floodwaters caused hearts and mountains to move, and your prayers helped get us back on the air and stronger than ever. Many don’t know this, but the day before Harvey, KSBJ had just finished an application to move our 89.3 signal from its current location in Plum Grove, near Splendora, to a new location in northwest Houston. We fully expected the process to take months, maybe longer, because that’s what it usually takes. However, the country was watching Houstonians come together, and it didn’t go unnoticed in the highest levels of government. Those floodwaters caused hearts and mountains to move, and in our case, it caused the approval process to go through the Federal Communications Commission in just eight days! Currently, the KSBJ signal is available to 4.3 million people in Greater Houston. By moving this 89.3 signal more than 30 miles southwest, KSBJ will increase its reach to more than 6-million people. For the first time, 89.3 KSBJ will now cover all of Houston, reaching 1.7 million more Houstonians! Now, we can express our thanks to our listeners, and to God as we see how He’s on the move in many mighty ways. In addition to the signal launch on Friday, March 22nd, KSBJ will also be hitting the streets of Houston March 25th – 29th to celebrate with our listeners.